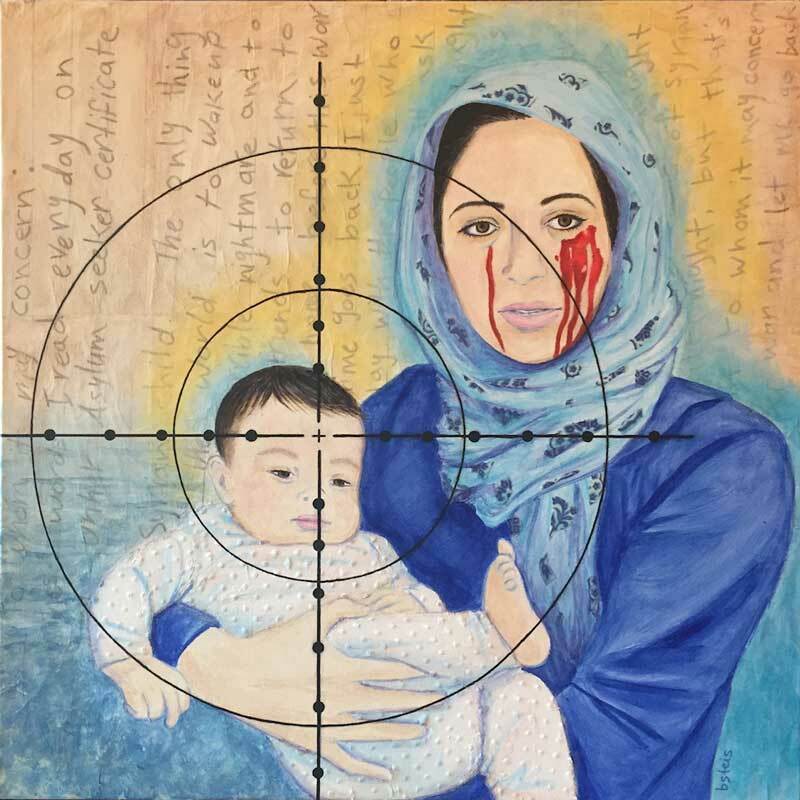 Last week my painting, ‘Yana & Child’ (depicting the plight of Syrian refugees), was featured in a human rights themed exhibition. My piece was shortlisted for the Hong Kong Human Rights Arts Prize and was featured at the Fringe Club gallery by the Justice Centre Hong Kong from December 4th-10th. Originally, when I found out about this contest I was going to do a piece on human trafficking, but the week I was to start working on it that tiny Syrian boy, Aylan Kurdi, washed up on the shores of Turkey and suddenly he was all over the news. The more research I did, the more inspired I became — inspired, empathetic, miserable, angry, and impassioned. There were so many stories that needed to be retold and put on display for people to experience, learn, and contemplate. I read devastating articles from 2013 about how Assad’s snipers were using pregnant women’s unborn children as target practice and how they were purposefully shooting to paralyze—not kill—children. The doctor in the reports says he’s never seen anything like it in his 20 years volunteering in war zones. It is a sickening kind of intimidation prescribed by the dictator of Syria to torture his own people. It’s no wonder they are standing up against him or running for their lives. I came across a stunning photojournalistic series by Sebastiano Tomada of an all-female unit of Syrian fighters of the free army. Women with a child on one hip and a machine gun on the other. Their husbands, brothers, sons and friends are all being killed so, “What choice do we have but to join the fight?” they ask. What choice indeed. There are endless images of “the boat people” or “migrants” as they were deemed for a while but these names don’t adequately describe the horror embodied in their plight. People are fleeing from one terrible situation directly into another. Many of the Syrians seeking refugee don’t make it safely to the shores of Greece or Turkey but if they do, there are more hardships to bear. The long journey to someplace safer, over boarders with people shouting, kicking and spitting at them. Living in the forests, on streets, or packed into tents (if they can find one) and dragging what’s left of their family along with them. See BBC reporter Manveen Rana’s twitter feed for photos of her up close journey with Syrians through to the Serbian border. Along the way the children are unforgettable, with images of them sleeping, crying, and sometimes playing. I found a beautiful letter written by a 15-year-old Syrian girl who has been living in one of the UNHCR camps in Jordan for the past 3 years. It’s a wistful account of the beautiful life she once had which she recounts in a dreamlike quality in comparison to her current nightmarish existence of living day by day in a tent, without a country to call her own, and remembering those who’ve already lost their lives. For this painting I focused on the women and children as I found it intriguing how my eyes were immediately drawn to them in a sea of people, and how even when they are exhausted there is a strength and an innocence that shines through, in a striking resemblance to the madonna and child. They have a sense of strength, grace, resilience, and a touch of hope. They’ve seen too much, they’ve felt too much, they know too much, and all they have to carry with them are their memories. Everything else is lost. If these refugees find a welcoming country they can begin to rebuild in a foreign land but, notwithstanding, it will continue to be a long, hard, road.